For additional items please see our many other pages as well. 1650-7. Light-House Establishment. 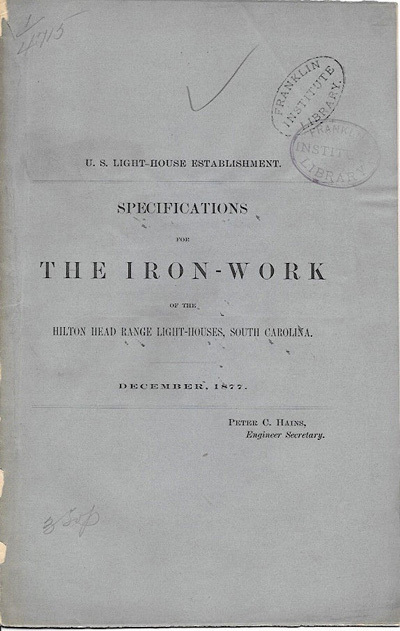 Specifications for The Foundation and Iron-Work of the Hilton Head Range Light-Houses, South Carolina. [Washington, DC]: GPO, 1877. 6 x 9". 11 pages, plus two loose two-page sheets with specifications. 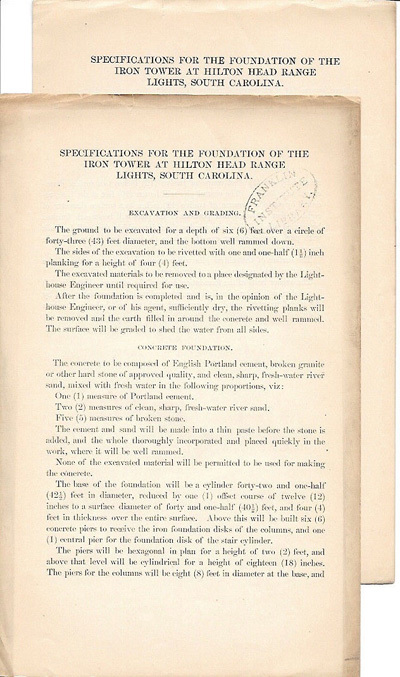 On July 31, 1876, Congress authorized the expenditure of $40,000 for range lights on Hilton Head and Bay Point to guide vessels into Port Royal Sound. Contracts for the work were executed in 1878. Both lights and dwellings were completed in June 1880, but the Lighthouse Board decided to delay activation of the lights until August 1, 1881, when the range lights on nearby Parris Island would be finished. Included are specifications for the concrete foundation (2 copies) central core and piers, iron work for rear and front light houses. Includes foundation discs and bars, columns, watch room floor, watch room and lantern room gallery railings, hand rails, stairs, wood-work, lanterns and roofs, and much more. This pamphlet originally accompanied a set of drawings (not present). Complete, wraps present, chipped and some soiling but still unusually good condition. Rare important booklet. (VG). $125. 7209s. Shelton-Roberts, Cheryl. LIGHTHOUSE FAMILIES. 2006. 210p. Soft cover. Living in a lighthouse was a way of life for the families of more than 5000 keepers and employees of the United States Lighthouse Service. These quiet people faithfully manned their remote outposts and withstood enemy attacks, hurricanes, and dishonest bureaucrats while saving countless thousands of lives. These men, women and children daily experienced physical hardship, round-the-clock work, isolation, and danger - and the strong bond of family. Though the Lighthouse Service no longer exists, many of the children who grew up at these stations do and their stories are preserved for the first time in this remarkable book. 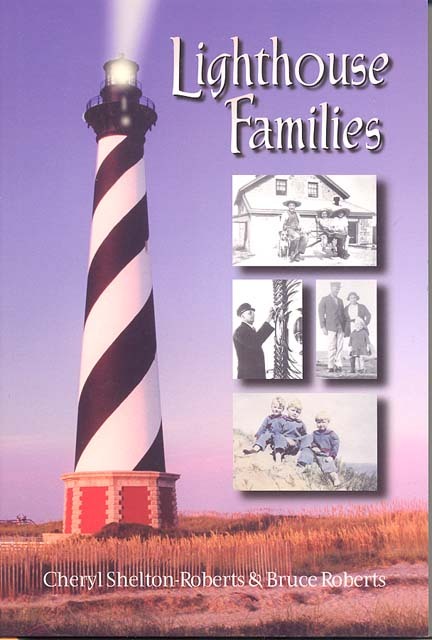 Family tales from Pigeon Point California, St. Augustine Florida, Saddleback Ledge Maine, Old Mackinac Point Michigan, Morris Island South Carolina and many more. Illustrated with over 100 family vintage photographs and a beautiful full color photo of the light as it appears today. This is a book that you won’t want to put down. (M). Published at $14.95. Our price $9.95. 1517. 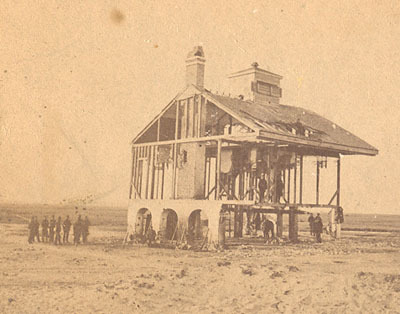 (stereoview) The “Beacon House”, Morris Island, South Carolina after the bombardment and the struggle for Fort Wagner, July 18, 1863. Stereoview by Sam A. Cooley, Photographer, Tenth Army Corps. Once a lighthouse, during the War this house on the beach at Morris Island was the headquarters of General W.H. Davis of the 104th Pennsylvania, and had also been used by General Gillmore as a signal station. Also visible is the beginning of the “Covered Way”, a part of the island’s fortifications. This original stereoview was produced by Cooley during the Civil War and provides great detail of the old light keeper’s residence and beacon light. Morris Island was the site of Fort Wagner (movie Glory) and this image was taken in 1864 or 1865. This is likely the only view of this early light station. Clear, close, some chipping to photos but do not affect image. Mount generally bright, clean save moisture to edge. Photographer’s label on back. (VG-). $135. HB-142b. 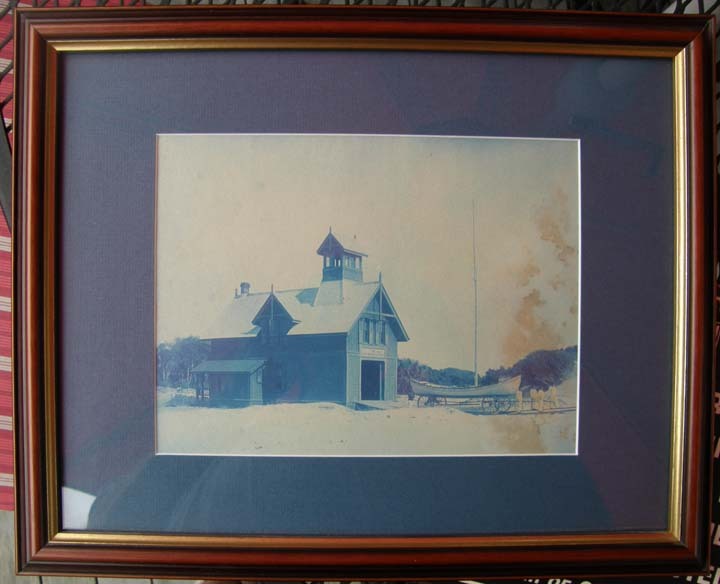 (framed photo) Morris Island Life-Saving Station, South Carolina c.1893. 8” x 10” framed to 13” x 16”. 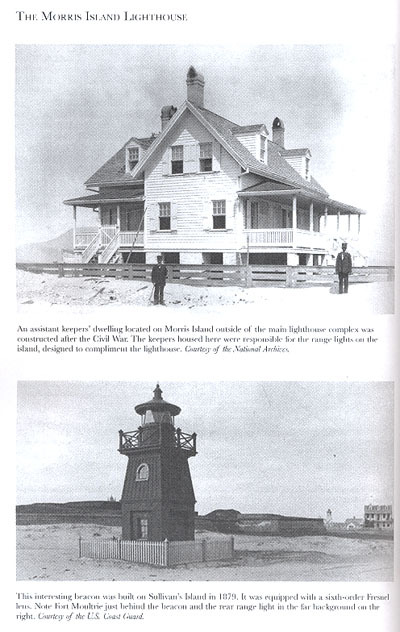 The Morris Island Life Saving station was constructed in 1885 near Morris Island (Charleston) Lighthouse. The station was an 1882-type station, almost identical to the Cape Lookout station. This photograph was taken in March of 1893 when the station was only eight years old. View is a wonderful, clear, crisp view of the station from the front left side. This close view clearly shows the entire building. On the boatramp is the surfboat on its carriage with the Keeper and four surfmen posing for the camera. Light moisture surrounds the surfmen at the bow, detracting only slightly from an otherwise stunning photo. Good contrast and crisp details make this photo a most desirable view. This image is one of only two printed, from the files of U.S. Lighthouse Engineer Herbert Bamber, who designed and supervised the construction of lighthouses across the country in the 1880-1920 period. Image is a cyanotype, blue on white, a process which lent itself to being printed in the field, and one that was able to capture exquisite detail. Photo has been beautifully matted and professionally framed. (VG+). $295. The 3 volumes of Lightships of the United States of America consist of a comprehensive listing of all the lightships that served under the lighthouse service and the Coast Guard. Each ship is outlined with the technical specifications of service, officers, and crews of each ship. The data and information includes all of the research done by noted lightship historian Willard Flint, as well as from other sources across the country, organizations and historical archives, providing a comprehensive view of the history of each ship. These volumes provide the reader with a complete historical reference of the lightship service in this country. Also included are hundreds of photographs of the lightships including on-station photographs, mechanical drawings, officers, crews and more. 10453a. Schoenewolff, Thomas. 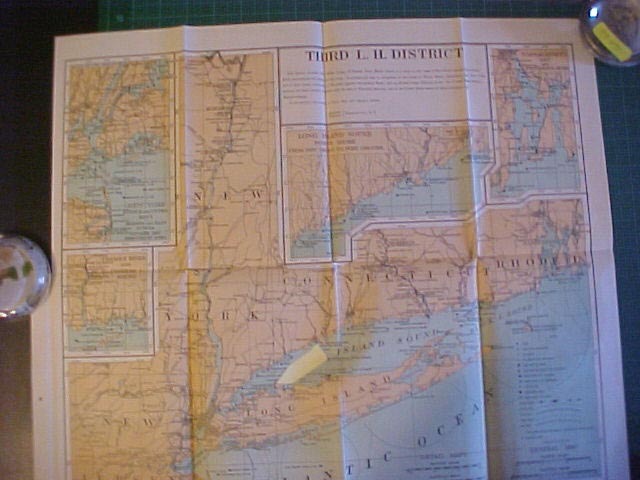 Lightships of the United States of America, Volume I – Northeast. RoseDog Books. 2010. Soft wraps. 368p. $61. 10453b. Schoenewolff, Thomas. Lightships of the United States of America, Volume II – Southeast. RoseDog Books. 2010. Soft wraps. 146p. $28. 10453c. Schoenewolff, Thomas. 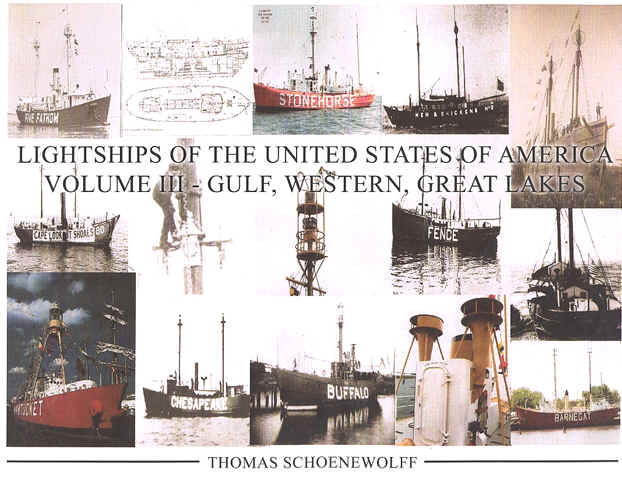 Lightships of the United States of America, Volume III – Gulf, Western, Great Lakes. RoseDog Books. 2010. Soft wraps. 188p. $38. 28300. DeWire, Elinore. LIGHTHOUSES OF THE SOUTH – Your Guide to the Lighthouses of Virginia, North Carolina, South Carolina, Georgia, and Florida. Stillwater . 2004. 160 p. DJ. A Pictorial Discovery Guide. A fresh look at the history and technological evolution of lighthouses in the area, the development of apparatus, architecture, construction and maintenance on their remote sites, the daily life of the keepers and much more. The author presents an exciting history illustrated with stunning photographs, historical anecdotes, architectural details and local legends. Lavishly illustrated, an excellent text on the subject and guide for the area. (M). Published at $29.95. Our Price $21.95. 28216. Clary, Margie Willis and Kim McDermott. South Carolina Lighthouses. Arcadia Publishing. 2008. 128 p. Soft wraps. 200 vintage photographs. Boasting one of the oldest lighthouses in North America and the most working lighthouses today, South Carolina has a long seafaring history. 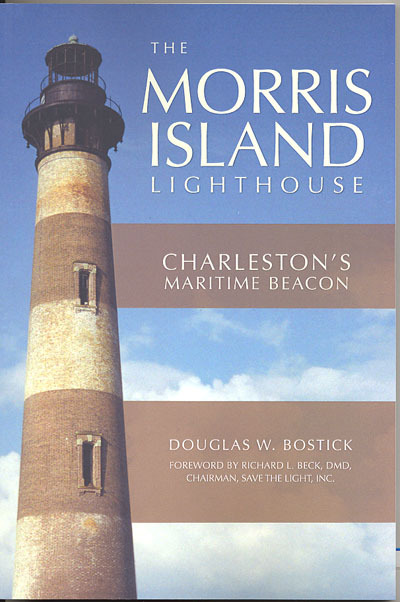 In 1767, the Morris Island Lighthouse was built at the entrance to Charleston Harbor , and before 1860, there were lighthouses in Georgetown , Cape Romain , Bull’s Bay, and Hunting Island . During the Civil War, all lighthouses on the eastern coast were darkened. Many were destroyed. After the war, towers that had been damaged were repaired, and additional lights were erected on Daufuskie and Hilton Head Islands . In 1962, the new Charleston Light on Sullivan’s Island replaced the Morris Island Lighthouse, which was suffering from erosion by the ever-encroaching sea. The new light contained an elevator and two rotating beacons capable of producing 28 million candlepower, a light that can be seen 26 miles out to sea. At that time, it was considered one of the most powerful lights in the Western Hemisphere . Another in the series from Arcadia , this volume draws from public and private collections, most never before published. Superb photographs, well worth it. (M). $19.99. 28217. Clary, Margie Willis and Kim McDermott. South Carolina Lighthouses. Arcadia Publishing. 2008. 15 p. Soft wraps. With one of the oldest lighthouses in the country and the most working lighthouses today, South Carolina boasts a rich lighthouse history. In this collection of vintage-photograph postcards, the authors explore these historic beacons’ pasts. Another in the series from Arcadia , this volume draws from public and private collections, most never before published. Superb views, well worth it. (M). $7.99. 3192. Hairr, John. SOUTH CAROLINA LIGHTHOUSES – Past and Present. 2002. 20p. Soft wraps. For centuries mariners have dreaded the South Carolina coastline, and for almost 200 years lighthouses and light-vessels have guarded these dangerous shoals. Read about these proud beacons, including many of those no longer in existence. 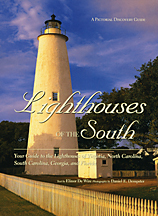 Includes many wonderful vintage and recent color photographs, well researched historical text, a unique map of South Carolina lighthouses, and directions to visit many of the lights, and more. Great reading at only $5.95. 720L,m,n. BEACONS ALONG THE SOUTHERN COAST. Harper’s Weekly. January 16, 1892 . 1p. 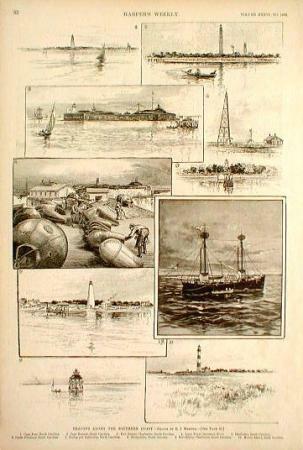 Beautiful, sharp, full page b/w multiple engravings of 10 lighthouse and light-ship scenes from North and South Carolina . Light Stations include Cape Fear, Cape Romain, Fort Sumter, Savannah River, Danfuskie, Castle Pickney buoy depot, Frying-Pan Light-Vessel, Georgetown , Fort Ripley and Morris Island . Superb for framing, one of the nicer for display. 11” x 14”. Quite clean, bright. (VG+). $44. 720k. BEACONS ALONG THE SOUTHERN COAST. Harper’s Weekly. January 16, 1892. 2p. Beautiful, sharp, full page b/w multiple engravings of 10 lighthouse and light-ship scenes from North and South Carolina. Light Stations include Cape Fear, Cape Romain, Fort Sumter, Savannah River, Danfuskie, Castle Pickney buoy depot, Frying-Pan Light-Vessel, Georgetown, Fort Ripley and Morris Island. Superb for framing, one of the nicer for display. Quite clean, bright. Full issue. (VG+). $58 net. 720e. BEACONS ALONG THE SOUTHERN COAST. Harper’s Weekly. January 16, 1892. 2p. Beautiful, sharp, full page hand colored multiple engravings of 10 lighthouse and light-ship scenes from North and South Carolina. Light Stations include Cape Fear, Cape Romain, Fort Sumter, Savannah River, Danfuskie, Castle Pickney buoy depot, Frying-Pan Light-Vessel, Georgetown, Fort Ripley and Morris Island. Superb for framing, one of the nicer for display. Quite clean, bright. (VG). $44. 6332-2. U. S. Lighthouse Service. LIST OF BEACONS, BUOYS AND DAY-MARKS. FIFTH LIGHTHOUSE DISTRICT. Wash. 1891. 118 p. Soft wraps. 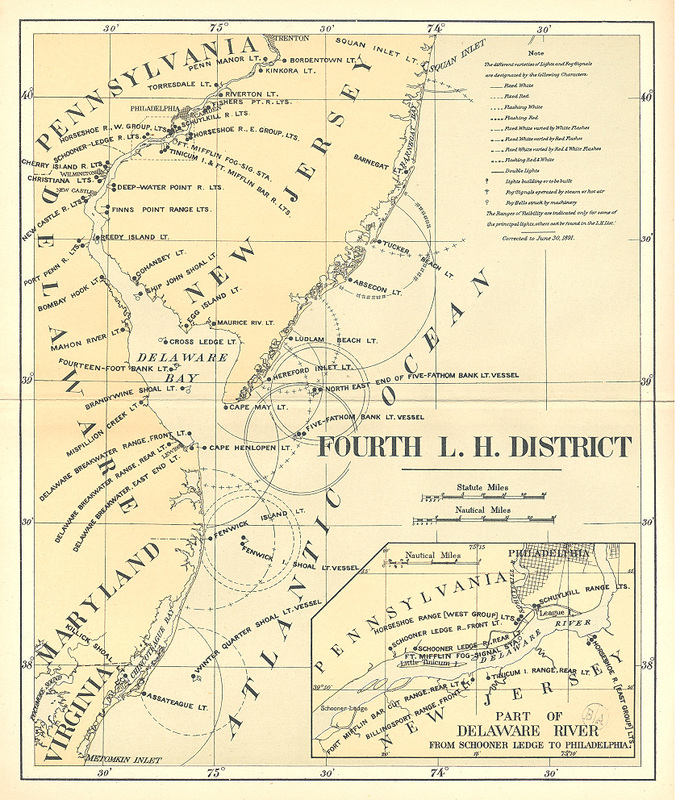 Includes all of the coastline of the Fifth Lighthouse District from Metomkin Inlet, Virginia to New River Inlet, North Carolina. Includes descriptions of lights and light vessels, buoys, fog signals as well as other important information. Includes location, height above water, distance seen, candlepower, description of structure, and more. Overall clean, tight but moderate wear, portion of front wrap missing, spine worn, edge wear. Very difficult to find these early Lighthouse Service lists and well worth the search. (VG-). $64 net. 6332gg. Light-House Board. LIST OF [LIGHTS], BUOYS, AND OTHER AIDS TO NAVIGATION CAPE LOOKOUT TO HILLSBORO INLET. SIXTH LIGHT HOUSE DISTRICT. Wash. 1911. 60 p. Soft wraps. Covers the coast from Cape Lookout , North Carolina to Hillsboro Inlet , Florida and surrounding area. Includes descriptions of lights and light vessels, buoys, fog signals as well as other important information. Includes location, height above water, distance seen, candlepower, description of structure, and more. Overall in unusually good condition for an early list, covers nicely intact with only a few chips, contents quite clean and tight, a very nice copy. Very difficult to find these early lists and well worth the search. (VG+). $74 net. Page updated February 27, 2017 . All text and illustrations on web site Ó James W. Claflin . 02/27/2017 All rights reserved. Use prohibited without written permission.